Dr. Randy Acker has been an instructor eight times at the KYON Total Hip Replacement course. The Registry of Approved Continuing Education (RACE) program of the American Association of Veterinary State Boards (AAVSB) certified Dr. Randy Acker as an instructor for Total Hip Replacement (THR) courses. 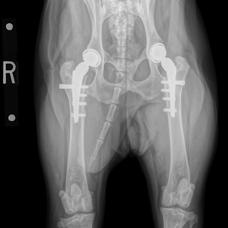 Sun Valley Animal Center has a high volume of Total Hip Replacement cases. Total Hip Replacement (THR) for dogs use two different types of surgical systems: cemented and cement less. Generally the cement less system is used at SVAC. We use both BioMedtrix THR and KYON THR systems. The THR system used depends on patient size and bone quality. Total Hip Replacement is available for both large and small breed dogs with systems developed by BioMedtrix and KYON. The CFX Micro Hip System is now available for breeds, such as Jack Russell Terriers and French Bulldogs, while the CFX Nano Hip System is designed for smaller dogs, such as Pomeranians, Yorkshire Terriers and even cats. Dr. Randy Acker performs both KYON and BioMedtrix Total Hip Replacements for large breed dogs as well as the CFX Nano Hip System and the CFX Micro Hip Systems for small breed dogs at Sun Valley Animal Center. Most patients arrive at Sun Valley Animal Center in the morning and go home the same evening or the next morning following the THR procedure. We rarely hospitalize our patients overnight. A complete physical exam and pre-operative blood work are performed on all patients to evaluate their general health, and to ensure that they are good candidates for anesthesia and surgery. Radiographs are taken of the hips, low back, and both knees. With this information, the best treatment for your dog is determined. Because some dogs have multiple problems, we ask that you are present for the morning exam and the decision making process. Anesthesia for the THR procedure is safe. Advanced pain management for THRs at Sun Valley Animal Center includes an epidural followed by local block while under general anesthesia. Vessels are sealed throughout the procedure and all of the sutures are under the skin, so there is no need for bandaging or suture removal. Aftercare is easy. Following our THRs, we request two weeks of restricted activity followed by short leash walks up to two months. We will call to check in with you during the healing process. Recheck appointments and Physical Rehabilitation are recommended, but only required in rare cases. At two months, off leash activity is usually permitted. We have a 90% success rate due to years of experience with the THR procedure, high quality instrumentation, and the KYON and BioMedtrix prosthesis. Complications are rare but can include infection at the surgical site, luxation, and implant failure. Most dogs return to normal or near normal function within 4 months of surgery. Following THR surgery and the healing period, patients can return to field trial, running, work, or any other activity that they performed prior to surgery. The package prices for our THR procedures are very affordable. The quoted price is inclusive with no extra fees attached. Please call Sun Valley Animal Center at 208-726-7777 for a quote and to schedule a Total Hip Replacement.